We’re appealing for witnesses to come forward following a robbery on Sunday 7 April in Epsom. Three teenagers approached a 14 year old boy in a small alleyway on Oaks Square between Blacks Burgers and Gummersall’s Solicitors (opposite the Co-Op) on Waterloo Road at around 7pm before threatening him and taking his mobile phone. The victim’s friend ran for help and approached a police officer for assistance. The suspects then made off from Police and got on a train where they were subsequently arrested in Sutton. All three suspects have currently been released under investigation. 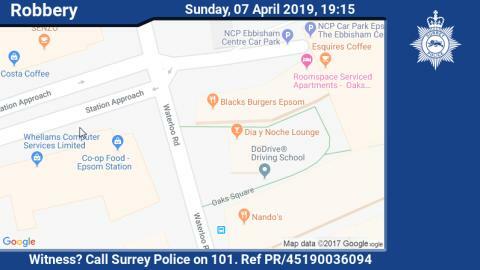 If you were in the area at the time and have information which might help us, please call 101 or tell us more on our website (www.surrey.police.uk) quoting reference number PR/45190036094. You can also give information, 100% anonymously, to the independent charity Crimestoppers on 0800 555 111 or through their anonymous online form (www.crimestoppers-uk.org).